As I dealt with the disadvantages of many of my personal circumstances, such as my health, my queerness and my trauma history, it was crucial for me to also reflect on ways I have power and advantage. Becoming vegan was just one outcome of this self-reflection – as was recognising the power in my relative maleness, and my white skin. As it’s about coming to terms with human advantages, being vegan does inherently come from a place of privilege. That’s kind of the point – we can’t risk, as activists, mulling only over our disadvantages – not only is it self-serving, it’s inherently disempowering. 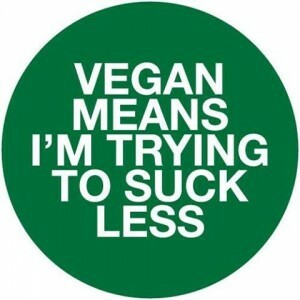 But given most vegans I know are queer or trans, disabled or mentally ill and relatively financially disadvantaged, I feel I want to challenge this idea that veganism is a privileged social position in and of itself, characterised by cis white able-bodied male hipsters, rather than just that, like all other movements, the animal rights movement is dominated by those who hold more of the social aces. In my experience, we often come to a place of reflecting on our own advantages from having understood the impact of others advantages over us. This is probably why I know a lot of queer and trans vegans, many of them disadvantaged in multiple ways. “Vegan” does not indicate, or confer any particular privilege, but just like every other rights movement people “getting it” about animals does not necessarily mean they “get it” on other issues. Vegans need to be pro-intersectional . . .
Caring about animal rights is only worth a damn in the context of caring about the rights of all animals, including human ones. Vegans who are racist and sexist, or who simply don’t give a crap what’s happening to humans in this world, don’t deserve praise for their ethics. Peta and its misogynistic campaigns are just one example of this. There are some oblivious vegan tub-thumpers out there who go too far. Yes, you can eat healthily vegan on food stamps, as one disabled trans friend of mine does, and it’s true that many of the word’s cheap staple foods are or can be vegan – rice and peas, tofu, bean chilli, tarka daal, chana masala, and pease pudding are traditional dishes from all over the world that would have been traditionally eaten in places where meat was rarely, if ever, eaten by poor folk. At the same time in the Western world it is currently hard to eat vegan, and if you don’t have the know-how, it is even harder. If you’re young, haven’t come from a culture where such cooking (or any cooking skill) is taught, and you don’t have access to cooking facilities or guidance, well then of course being vegan may be nearly impossible. So there is an element of privilege speaking in the assumption that “everyone can do it” even if vegans are far from being members of an elite. We need to let go of the idea that everyone could, or should, be vegan. Some folks cannot manage health on a vegan diet, and many people with eating disorders find the topic of veganism triggering. My life-long vegan friend has recently had to concede to eating eggs on doctor’s orders. Another could not manage her anaemia. Another vegan found she was developing problematic eating issues. Let’s not be ableist and assume it’s as easy for everyone. Many traditional cultures work in harmony with hunting or agriculture in ways that are the very antithesis of modern intensive farming. Western vegans would be colonialist to attack such traditions. Equally, there is a racist undercurrent to many animal rights “shares” on social media – where we are encouraged to condemn the eating of dogs in other cultures more than the eating of pigs in our own. So sure, the animal rights movement, like every other movement, needs to learn to be pro-intersectional, and often fails at this. Just like angry feminists and bolshy transactivists don’t “help our cause” so the existence of a bunch of non-intersectional vegans out there on the internet haven’t exactly paved the way to vegan peace in our time. But there are assholes in every movement, and they are always used as an excuse to attack the rest of us, in every movement. Arguably there are many people who talk about “vegan privilege” as an excuse not to reflect on the relative privilege of being human. Which, if they’re disadvantaged and in the middle of their own struggle is quite understandable. But it’s also a shame, because such reflection is empowering and enriching. Learning compassion towards beings more vulnerable than us has a profound effect on our own wellbeing, how we treat ourselves, how we treat those around us. This is futile if we reflect on human privilege in isolation from other structures of oppression. Our food choices need to consider the impact on the lives, environment and culture of all the beings on this planet. And if we do find ourselves worrying more about sheep than we worry about what’s happening to our fellow humans, then we need to do some soul-searching. But for those of us who struggle with the gladiatorial arena that is social justice activism, going vegan is a way vulnerable people can do our little bit for the planet. Because giving up animal products does not just mean less animal cruelty, it means a massively reduced carbon footprint, massively reduced water consumption, and it means we are directly consuming crops that would have gone for animal feed, meaning there is more food to go around. All these things have a profound sociological impact, particularly on the world’s more vulnerable cultures. So please don’t judge me for being vegan and I won’t judge you for not being vegan. I am just trying to do my best for a global community that needs as much care and compassion as we all can muster. This entry was posted in Uncategorized and tagged Intersectionality, Transgender, Vegan on May 26, 2015 by Sam Hope.